How much do you think it is possible for one woman to change a man? 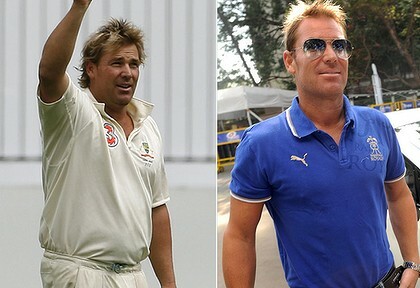 As a cricketer I wouldn't dispute Warne being classed as the worlds greatest cricketer but as a person....ughhh. Apparently yesterday a cyclist banged on the bonnet of his Mercedes so Warne is calling for all cyclists to have their bikes registered,...if this should happen could I suggest that anyone known to have sent lewd text messages on a mobile phone should be banned permanently from ever possessing another mobile phone?? Actually, 9msn for what that's worth ran a poll and I think the majority agreed that cyclist should have number plates. I recently had a run-in with a cyclist and it seems to me that at least on this occasion the cyclist believed that he was in the right when he clearly was not and had a derogatory attitude to all motorists. Motorists who build the roads through paying registration. So I sympathise with Warney who has apparently not undergone any form of plastic surgery. I also remember the days when cyclists kept to the left of the road. You am welcome for I'm post, I very much enjoy your happiness. Nice Engrish too.